In the early 1990s, the Nevada Museum of Art (NMA) in Reno took the inspired initiative to build a signature-focus collection of contemporary landscape photography. The motivation was to gather landscape works that would address audiences across cultural boundaries and, over time, to position the Museum as a unique visual and intellectual resource. The NMA sought to highlight environmental issues, already emphasized in other areas of the Museum’s collection, and provide a forum for the study and appreciation of the land. NMA Curators recognized the importance of investing in and focusing on landscape photography, and began the process of assembling an internationally significant body of work with an emphasis on the Great Basin region. The NMA’s goal was to recognize the tremendous contribution that photographers have made to our understanding of place and environment, while building its collection in a new direction. As part of the initial concept, the Museum organized a major exhibition and catalogue to present this project to the public. Now, a decade later, The Altered Landscape collection numbers 650 photographs, making it the largest focus area within the Museum’s collection. From the beginning the idea was to collect ‘bodies of work’ rather than individual photographs. The Altered Landscape exhibition is, at its core, about the American west, especially the Great Basin. As the eastern landscapes depicted by the Hudson River School painters gradually disappeared through conversion to human settlement, the west assumed a greater role as the representative of the idea of ‘wilderness’, as the last repository of natural beauty. For generations, photographers such as William Henry Jackson, Timothy O’Sullivan, Carleton E. Watkins, Edward Weston, Imogen Cunningham, Ansel Adams, and Eliot Porter played a leading role in how the landscape was perceived. Their imagery projected and reinforced a romanticized view of the environment in which landscape is an expression of a beautiful and sublime ‘nature’. By the mid-1970s, however, a small group of photographers, including Robert Adams, Lewis Baltz, Joe Deal, Bernd and Hilla Becher, and Frank Gohlke began to challenge this traditional view. In the influential exhibition at George Eastman House in 1975 titled New Topographics: Photographs of a Man-Altered Landscape, these photographers focused on contemporary industrial culture – land transformed by human presence. Collectively, they rejected the approach of viewing landscape as beauty, for the ‘sake of art’, isolated from the context of culture. For the New Topographics photographers, as they came to be known, landscape photography needed to reveal a new artistic viewpoint in response to the specific content of the images. That viewpoint was often critical, sometimes ironic, occasionally funny, but always aimed at overthrowing the notion of ‘style’ that their generation had inherited – for them style was not an option. It is this attempt to expunge individual style that allows the New Topographics to be seen in light of Roland Barthes’ announcement of the ‘death of the author’ in which one is left with just ‘the text’; in this case just ‘the land’, what is built on it, and the viewer’s reception of what the photographer has seen. The NMA’s Altered Landscape collection clearly takes New Topographics as its starting point. The Altered Landscape focuses in large part on the topography of what is called the ‘new’ West. These post-1945 images depict disturbed landscapes in the United States and elsewhere, with an emphasis on nuclear, military and mining sites documented by photographers such as Peter Goin, Richard Misrach and Sharon Stewart. Other images by Joe Deal, Lewis Baltz, and Martin Stupich document the constructed landscapes of sprawling housing developments and water projects. 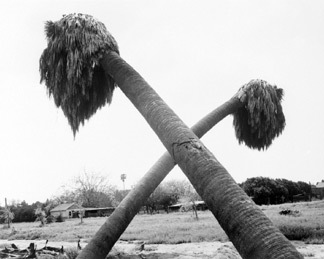 Others, including Greg MacGregor, use the re-photographic strategy to reflect upon how land has been transformed over time. The critical edge to some of the works in the exhibition is very clear: Sharon Stewart’s photographs include a text component documenting environmental catastrophes, while other artists, such as Robert Dawson and Wanda Hammerbeck more subtly characterizes human transformation of the land. The concept of the Altered Landscape, seen here as a phenomenon emerging out of the American West, is in fact being explored throughout the world in a range of different ways. Land use is a global issue. For the NMA, the Altered Landscape collection represents a way of assessing environmental history and sense of place. This raises a wide range of questions. For instance, is it possible to picture how ‘the system’ actually works? Does a picture of a mining site show us a mine or a cross section of the physiology of that ‘system’? Is it really possible, as the text in the New Topographics catalogue asked, to negate style and make a style-less photograph? Since the New Topographics catalogue essay by William Jenkins posed the question in 1975, “Is there a difference between what a photograph is of and what it is about?”, has that distinction been refined, or are most photographers working today in a context that was created by Dan Graham, Ed Ruscha and the photographers in the New Topographics in the 1970s. The selection of works for this exhibition was made by Diane Deming from the Nevada Museum of Art, and Bill Jeffries from Presentation House Gallery. Probing the land - A Series of Talks on Picturing Altered Landscapes. A short talk on the Altered Landscape and walking tour of the exhibition with Presentation House Gallery's Director, Bill Jeffries. Thursday April 22, 8 pm | An illustrated talk by Claudia Beck exploring the relation between the New Topographics and recent Vancouver photographic practices. Claudia Beck is a Vancouver writer and was co-owner of NOVA Gallery (1976-82). An illustrated talk by John O'Brian on the interconnections between photography in the American West, and the conduct of the cold war. John O'Brian is a professor of Visual Art & Theory in the Department of Art History at the University of British Columbia (UBC). 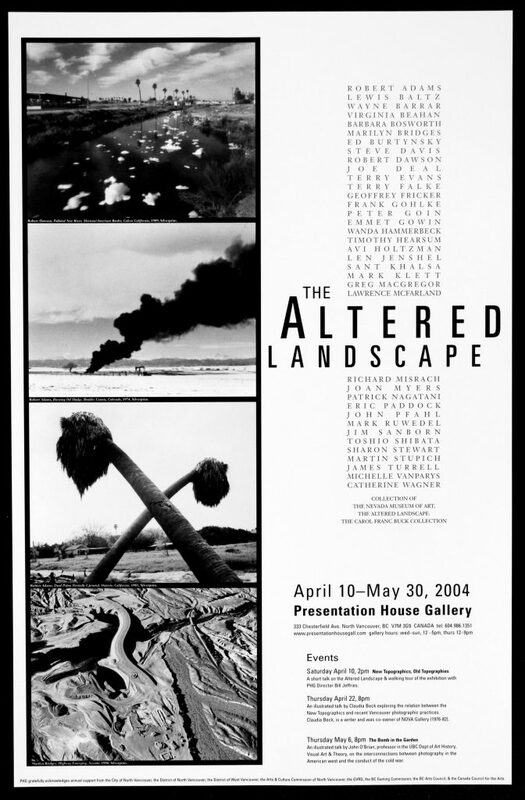 Poster for the exhibition "The Altered Landscape"